In 1960 Ian Fleming penned his 8th Bond adventure. This time, Bond wasn't back in a full length novel, but a series of five short stores in the volume entitled "For Your Eyes Only". "From A View To A Kill" opened this volume. In 1961 John McLusky and Henry Gammidge teamed up to bring Fleming's "From A View To A Kill" into pictures. The comic strip ran for 10 weeks in the UK publication, The Daily Express. 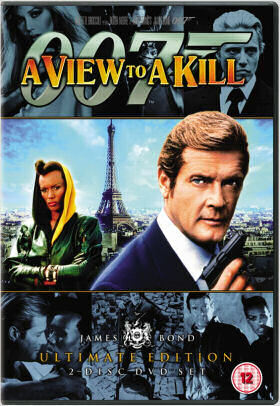 Come 1985 EON Productions released "A View To A Kill", borrowing an Ian Fleming title for their film but dropping the "From" to make it more succinct. However Moore's final outing as Bond bore very little resemblance to Fleming's short story. That same year, Domark began its series of James Bond tie-in games for Commodore, among other platforms. This platform style game, the first Bond video game ever, featured a mere three levels. 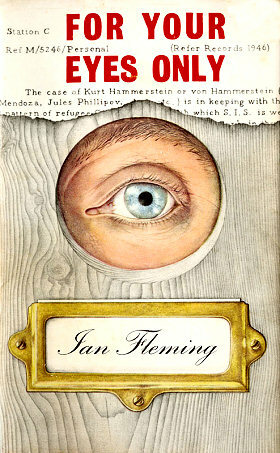 On the 11th of April, 1960, Jonathan Cape published Ian Fleming's collection of short stories entitled For Your Eyes Only. Fleming's 8th Bond publication opened with the short story "From A View To A Kill". Synopsis: A motorcycle dispatch rider is shot and killed and his documents stolen. Bond goes to investigate, and near the crash site he discovers and underground base of Russian agents. Dressing up as a dispatch rider, he shoots his Russian trailer and takes his place. This exposes the whole operation. "Five hundred yards, four hundred, three, two, one. The man coming up from behind slowed to fifty. He put his right gauntlet up to his teeth and pulled it off. He stuffed the gauntlet between the buttons of his tunic and reached down and unclipped the gun." Between June 25th and September 9th, 1961, The Daily Express published "From A View To A Kill", the comic strip. John McLusky, Bond comic veteran, again picked up the pen to give Bond his image and Henry Gammidge set about adapting Fleming's short story. The short, sharp story adapted well to the comic series and much of the narritive is revealed though 'thought bubbles'. Synopsis: A motorcycle dispatch rider on course to the British Secret Service HQ in Fourqueux, France, is shot and killed and his documents containing Joint Intelligence stolen. 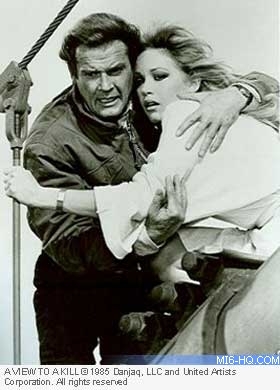 Bond goes to investigate, and near the crash site he discovers and underground base of Russian agents. Dressing up as a dispatch rider, he shoots his Russian trailer and takes his place. As he exposes the whole operation, his life is saved by Mary Ann who turns up at the end with men from the St. Germain station. Above: The opening panel of "From A View To A Kill"
"A British despatch rider's been shot in cold blood. They're getting top intelligence gen. SHAPE security can't cope and they're after M's blood - blaming him!" In 1985 Roger Moore returned for his seventh and last outing as 007 in "A View To A Kill". With a title taken from the work of Ian Fleming, Richard Maibaum and Michael G. Wilson crafted a high-tech computer age plot with little to no resemblance to the origional Fleming story. Principal cast included the Oscar winning Christopher Walken and Patrick Macnee, of TV's "Avengers" fame. Synopsis: Millionaire psychopath Max Zorin is the mastermind behind a scheme to destroy Silicon Valley in order to gain control over the international microchip market. With the countdown ticking toward a cataclysmic disaster, James Bond must stop this madman from achieving his goal. Bond: "Well my dear, I take it you spend quite a lot of time in the saddle." Jenny Flex: "Yes, I love an early morning ride." Bond: "Well, I'm an early riser myself." An impressively high score rate on the tottyometer this time out: Bond gets his end away with Kimberley Jones, May Day, Pola Ivanova and, right at the end of the film, Stacey Sutton. Curiously, he gets a chance with Sutton earlier in the film but opts instead to sleep in a chair watching over her as she sleeps. May Day: "Someone will take care of you!" Bond: "You'll see to that personally, will you?" Bond veteran, John Barry returns again to score "A View To A Kill". Hit pop-band, Duran Duran, are invited to perform the title-song which rocks the music charts making number 1 the US and #2 in the UK. 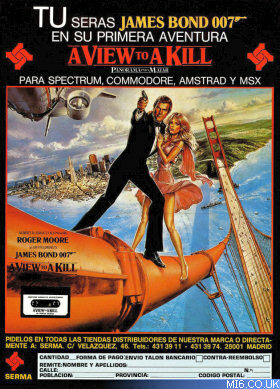 "A View To A Kill" makes the highest chart rating ever for a Bond theme. The popular Beach Boys number, California Girls, also makes a cameo in the pre-titles sequence. On June the 7th, 1985 Domark published their first movie tie-in game. The game was compatible with platforms of the time, Commodore 64, Spectrum 48K, Amstrad CPC and MSX, but the quality of gameplay left much to be desired, even for the period. Synopsis: Your objective is to discover what dastardly plan is being hatched by Max Zorin, an unscrupulous European electronics magnate, and prevent him from carrying it out. You learn that the information you need is in three main locations. Paris, where you must make contact with May Day to get a vital clue. The City Hall in San Francisco, where various secrets are hidden, and finally a Silver Mine under Silicon Valley, where you piece together your information and finally foil Max Zorin - we all hope!